The Bouman-Stickney Farmstead is named for its former owners. Dutch homesteader, Thomas Bouman, originallypurchased the property sometime before 1740. 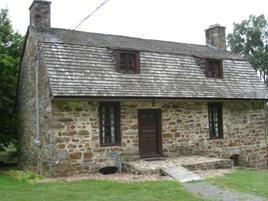 The house was built in 1741 and stayed in the Bouman family until about 1855. In 1935, Broadway playwright and producer Howard Lindsay purchased the house and surrounding property as a gift for his wife, Broadway and movie actress Dorothy Stickney. Ms. Stickney and Mr. Lindsay used the house as a weekend and vacation retreat until Mr. Lindsay's death in 1968. The house and surrounding 68 acres were purchased by Readington Township from Ms. Stickney in 1997. The house is a magnificent stone bank house with Dutch and German architectural influences. The stone for the facade, as well as the timbers for the frame were harvested from nearby Cushetunk Mountain. Also located on the farmstead is a double corn crib wagon house built in the 1820s which sits in the northeast corner of the property. Donated to us by Merck, it was originally located on a farm which is now part of the Merck Property. 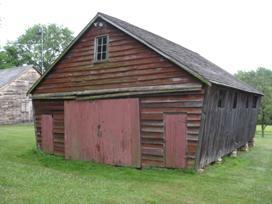 Though it was originally used to store wagons and grain, today it holds the Museums' collection of early farm tools. Located on the Farmstead is an example of a relatively rare farming structure - a New World Dutch Barn. The original barn sat on the Wade Farm property and was moved to the Bouman-Stickney property in 2000. The barn's skeleton was taken apart piece by piece and carefully labeled to facilitate reconstruction at the Farmstead. The cladding is new, but the supporting structure is original. The design of a "Dutch" barn really comes from a region of the Netherlands that borders Germany. One of the distinguishing features of a New World Dutch Barn is the low side walls and the steep, symmetrical roof. Double doors intended for wagons were most often found in the gable end. The wagon doors access the "threshing floor", the largest of three bays in the barn. The smaller doors on either side of the gable end access the side bays, originally used for sheltering farm animals. Another distinguishing feature of a New World Dutch Barn is the "H-frame" construction. This type of construction is characterized by a heavy anchorbeam (the large horizontal beam) attached and braced to end posts. This type of construction allows for a wide central bay for wagons to enter through one gable end, unload their goods, and exit through wagon doors in the other gable end. Grain was stored above the anchor beams in a loft with a sapling floor. This floor allowed for good air circulation during storage. When the time came grain was dropped onto the floor and threshed in the central bay. The anchor beams in our barn are mortised through the end posts and pegged. In the picture to the left, the anchor beam has an orange tag - this tag is the label that assisted in the reconstruction of the barn. The tenon extends through the end post and ends in a taper. Experts who have seen pictures of our barn describe it as a "scribe rule" barn, most likely built before 1820. "Scribe rule" refers to a method of framing.